After the state began managing the park in the 1960s, a bathhouse and beach were installed. Later, under the direction of city planner, Robert L. Bendick, Jr. ( who went on to become the Director of the state Department of Environmental Management), a combination of state, Federal, and community agencies revamped the park with lawns and a fountain. Footpaths, playground equipment, tennis and volley ball courts were added. 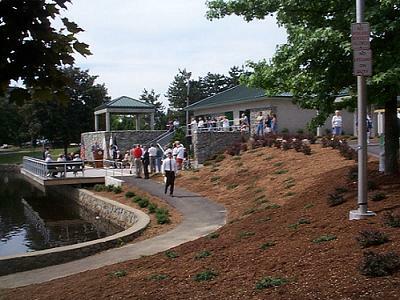 The former bathhouses and decks from the 1960s were replaced, and the park assumed its popular sobriquet, “Social Ocean.” In May of 1977, the present name of World War II Veterans Memorial State Park was dedicated. In 1979, the first AutumnFest took place. AutumnFest is a three day fair and community extravaganza anchored at the park, featuring food, exhibits, and entertainment, topped off by a giant parade. It is one of several signature community events for Woonsocket and all northern Rhode Island.